Peter Piper Pizza Kids Day Fun Tuesdays! Peter Piper Pizza has announced a Fun & Frugal summer program for kids that will be held on Tuesdays of each week during the months of June and July. This program differs by location and I have given a breakdown of events by location below. Peter Piper Pizza has announced a program for kids throughout the summer called “Summer Kids Days”. Every Tuesday from 10:00am – 12:00pm throughout June and July, kids ages 3-12 will get to experience nonstop fun at Peter Piper Pizza that will include 2 slices of Pizza, a 12oz Drink, five game tokens and a make-and-take craft. All for just $4.99 per child. What I truly like about this program is the fact that there will be a different education theme each Tuesday. I have listed the themes for June below. You can visit Peter Piper Pizza for more information and the theme list for July. 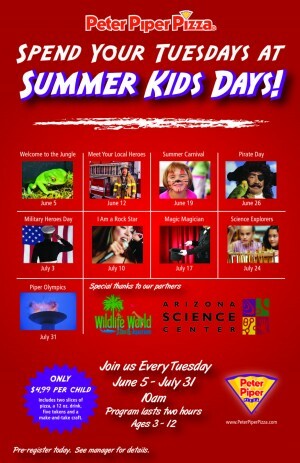 Peter Piper Pizza presents “Kid’s Day” every Tuesday from 11:00am – 1:00pm during the months of June and July. Children 3-12 can enjoy 2 slices of pizza, a kids drink, dessert and prizes for only $3.59 per child. Kids will also enjoy a weekly themed activity. I have listed the themes for the month of June below. 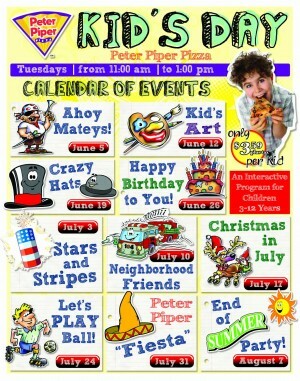 Visit Peter Piper Pizza for more information and a list of July’s themes. Previous postTexas State Parks FREE Fishing in 2012! Next postChick-fil-A ~ FREE Milkshake at North East Mall Today!